Why the need for Fanless Computing Products? Cooling fans draw in dirt and dust from their operating environments potentially causing catastrophic failures and/or costly interruptions and downtime. Fanless Small PCs are engineered to dissipate internal heat by utilizing the latest heat pipe technology in an encapsulated rugged chassis design. Save time/money and reduce the worry. No planned maintenance to clean cooling fans or discovering a clogged fan has shut down your application or process. Quite and Silent, No noise! When used with SSD the fanless PC is completely noise free making it ideal for control rooms, audio recording, board rooms, deep thinking and other areas that need to be low in ambient noise. Numerous designs and configurations to meet your application needs. Deployable in limited space or in rack packaging offering multi I/O, removable media, DC power, Wireless and more. 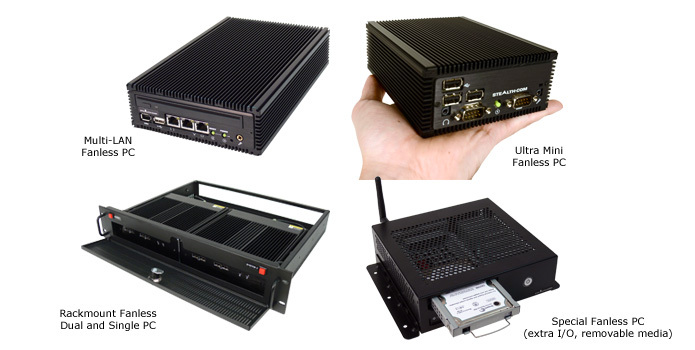 Fanless computer products are an excellent fit for many applications including; Embedded Control Audio/Video recording, Digital Signs, Interactive Kiosks, Thin-Clients, Human/Machine Interface and your next applications. For more detailed information and to see Fanless Small PC models, click here.